Managing the Aigas Wildcat Conservation Programme is always an exciting affair; each day different to the next, adding new foliage to enclosures, cleaning out den boxes, checking the stealth cameras for mating behaviour can all be components of a standard week. But, one day towards the end of last year was exceptionally interesting… Our young male Coll needed to have a blood sample taken for genetic analysis. Both his parents have scored high on their genetic test and Coll is likely to score even higher. We took the opportunity while Coll was under anesthetic to take some close up images of his pelage. 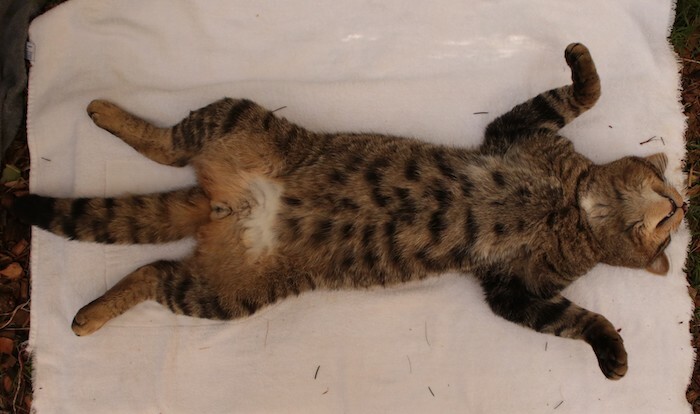 All wildcats in the conservation breeding programme have had their lineages traced and genetics sampled to ensure only genetically strong wildcats go onto breed. If an individual has more than 75% of its genes originating from wildcat ancestry they can be accepted into the breeding programme to pass on those wildcat genes. At Aigas all our breeding individuals have scored over 88%. 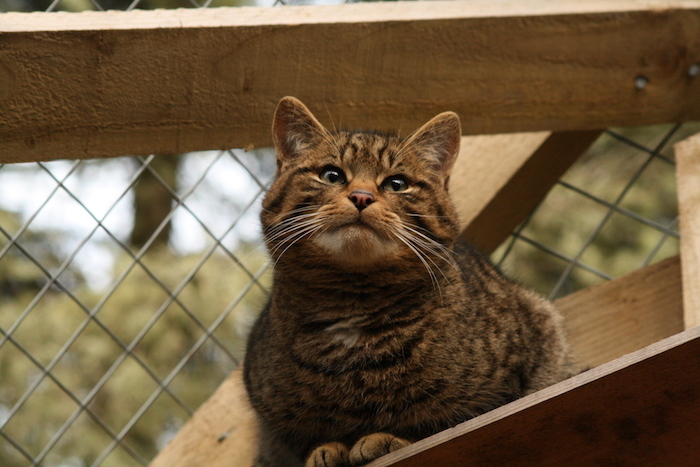 The careful management of the Scottish wildcat studbook, by the Royal Zoological Society of Scotland, ensures that the wildcats breeding produce genetically diverse offspring. 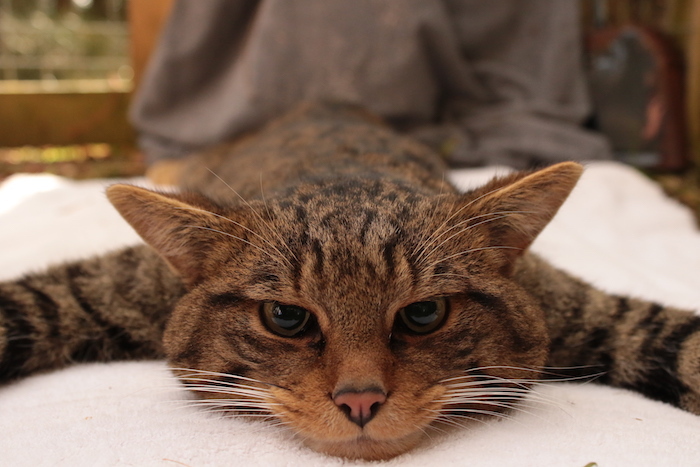 Through this meticulous management of the captive wildcat population, feral cat genes can be bred out, so the wildcats marked for release into the wild will have the strongest wildcat genes, giving them the best chance of survival. We are currently waiting for Coll’s genetic test results to come back. These photos of our young male Coll while he was under anesthetic. We took the opportunity to take detailed photos of his pelage so it can be scored. 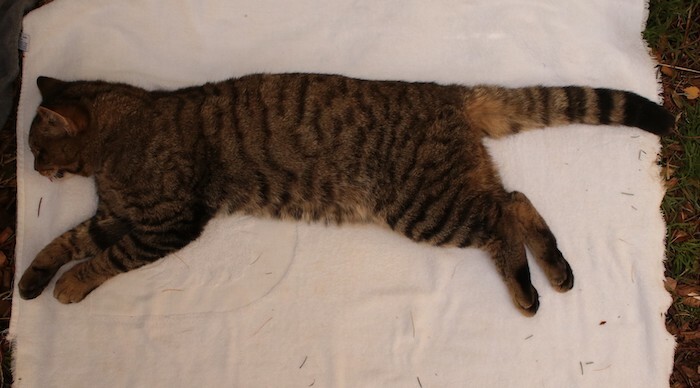 This information will reveal more on how genetics affect wildcat pelage. Though I have worked closely with these animals for nearly 3 years this was the first chance I had to put my hands on one. Whilst Coll was under anesthetic, Ben could look more closely at his markings. The Clan Chattan Confederation motto is ‘Touch Not the Cat Bot a Glove’, using the fierce nature of the Scottish wildcat as a metaphor to warn others to be cautious of the clan. I would never attempt to touch one (glove or not! ), but with Coll in a docile state I had this rare opportunity. Feeling his weight (5kg), the thickness and soft texture of his coat and the needle like sharpness to his claws, made this day a truly special one for me. Coll is now back to his usual self. Coll is now back with his partner, eating loads and looking strong, his coat is even thicker now in the heart of the Highland winter. How well done. We Macphersons are so proud of our wildcat image and I pray that this amazing animal will thrive and return in good numbers to the wild. Unfortunately, I saw a scroll on CNN this morning about the very serious decline of the insect population on a global scale which of course would be catastrophic to all living species including mankind. One of my favorite poems by Robert Burns, Wee Mousie, has a line about the bond between man and nature being broken. How farsighted he was. Well written essay and keep up the good work. It was very interesting to read this article and see the very good pictures, thank you. We have added a link to it from our web site and will add a link from our Facebook pages. It may interest you to know that we have a slightly different interpretation of the motto (which we share with Clan Chattan). Our interpretation is that the ‘glove’ referred to is when the cat has its claws retracted or ‘gloved’, so it is not so much protecting oneself against the cat, but not approaching once our ire is up! I have been fascinated by these beautiful creatures since my first Aigas visit last fall. I’ve also gained further education through watching the BBC special “Tigers of Scotland” multiple times. I look forward to visiting Aigas again in October 2019 and hearing the latest on the wildcat project there.